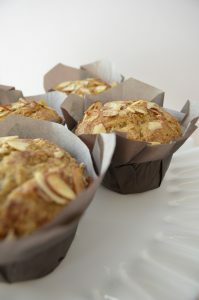 This muffin recipe goes together very quickly and is soft and moist, just like a muffin should be. Since this recipe makes just 6 perfect muffins, you won’t be “enjoying” these for the next 2 weeks. Bake the batter in fancy cupcake papers to add some flair to your breakfast or buffet table. 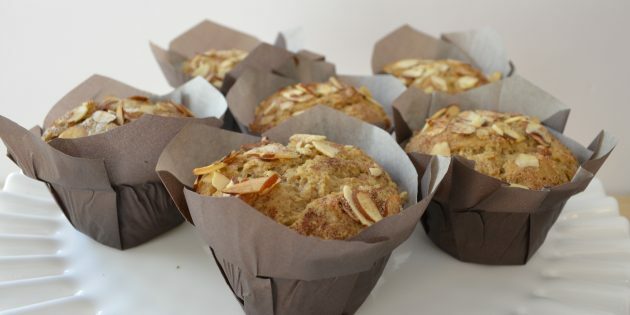 Place paper muffin liners in a 6 – cup muffin pan and set aside. In a medium sized bowl, whisk together the gluten free flour blend, baking powder, baking soda, xanthan gum ( if needed), salt, orange zest and the cinnamon. In a large bowl, place the egg whites, applesauce,honey and the orange. Beat with a hand held electric mixer until completely combined. Slowly add in the dry flour ingredients to the applesauce mixture. Try not to make a massive dust cloud which happens often with fine textured gluten free flour. Use a cookie scoop and evenly distribute the muffin batter between the 6 wells. Sprinkle the tops with the sliced almonds. Set aside on the counter to rest for 30 minutes. Meanwhile, go ahead and preheat the oven to 350 degrees. When the 30 minutes is up, pop the muffins in the oven and bake for 18-20 minutes or until a toothpick inserted in the center comes out clean. Cool in the muffin pan for 5 minutes, then carefully pop the muffins out and place them on a wire rack to cool completely. These are awesome with butter and strawberry or raspberry jam. Or spread with softened cream cheese. Happy Baking! Nutritional Info: Calories 142, fat grams 1, sodium 224 mg, carbohydrates 33 grams, fiber 2 grams, protein 4 grams.